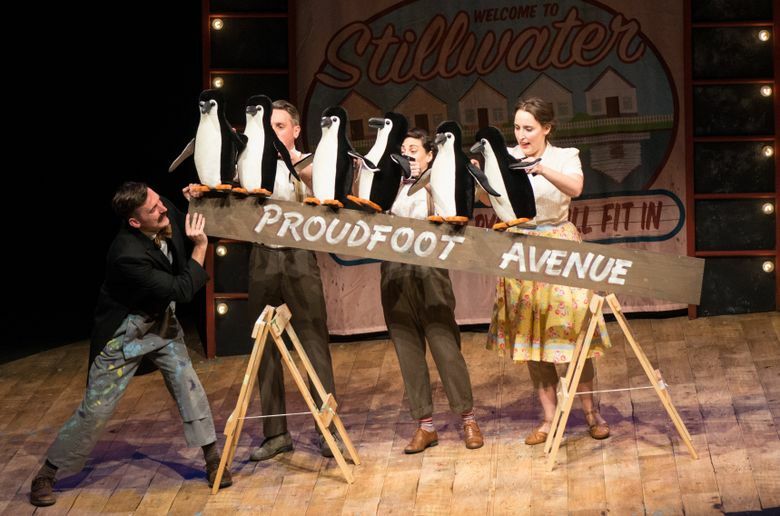 This charming, small-scaled show, imported from England’s Pins and Needles Productions, features expressive, hand-manipulated puppet penguins sure to waddle their way into your affections. Penguins are birds that don’t fly. And they don’t march — at least not in “Mr. Popper’s Penguins” at Seattle Children’s Theatre. But these fine feathered fowls do plenty of cavorting, squawking, wing-flapping and circus tricks as they waddle their way into your affections in this utterly delightful musical theater import from England’s Pins and Needles Productions. The charming, small-scaled show is based much more closely on the classic children’s book by Richard and Florence Atwater than the 2011 movie adaptation of “Mr. Popper’s Penguins” starring Jim Carrey. 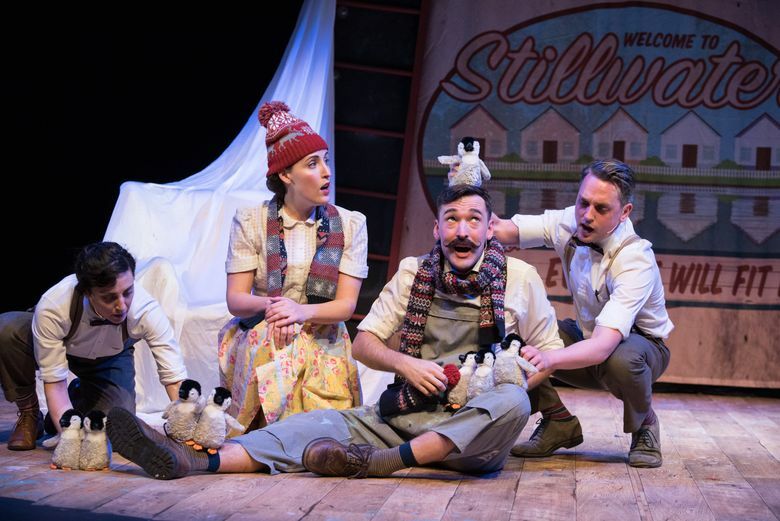 Aimed at viewers ages 4 and above, the traveling production is a compact piece of story-theater that regales us with the antics of a brood of penguins who come to (happily) dominate the lives of Mr. and Mrs. Popper, a pleasant British couple in a mythical town called Stillwater. Portrayed by a cast of quite expressive, hand-manipulated puppets, about knee-high tall, these beloved, quirky creatures, clad in a tuxedo-like pattern of feathers, are a bit Cat-in-the-Hat as they take over the Poppers’ modest bungalow. 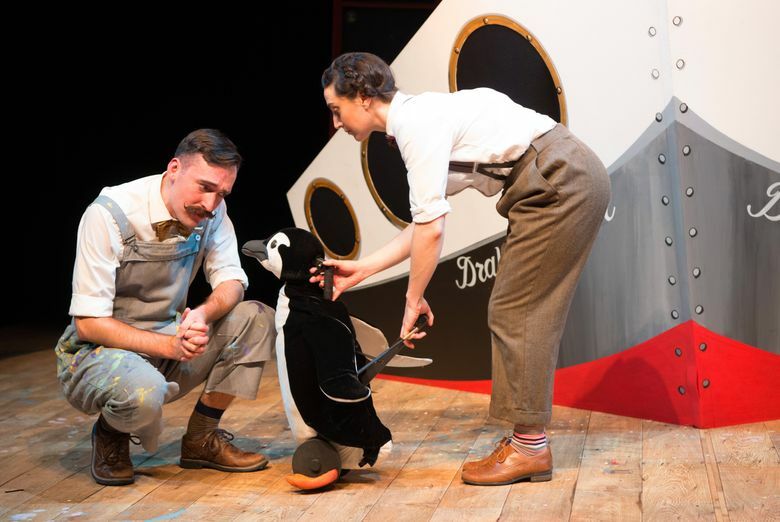 But before the first one arrives in a large cardboard box, direct from Antarctica, we get to know Mr. Popper, an affable house painter (played by Russell Morton), and his chipper, practical wife (Roxanne Palmer). Though Mr. Popper has never strayed far from his humble home, his hobby is studying famous explorers and their far-flung expeditions. And if his dreams of exotic adventures don’t exactly come true, thanks to one of his explorer heroes he suddenly becomes the owner of one black-and-white penguin, whom he names Captain Cook. Then another penguin arrives, breeding ensues, and soon there are 10 altogether. But how to afford the fish bill for this extended family? The answer: showtime! The Poppers put together a (very amusing) penguin act and, of course, become a sensation on the vaudeville circuit. With its gentle story of caring for wildlife (and, ultimately, releasing the creatures back into the wild), and its cheerful songs (by Luke Bateman and Richy Hughes), “Mr. Popper’s Penguins” is a disarming diversion. It is also mildly instructive (helpful, given the dangers Arctic penguins face from global warming), and a nice relief from more hard-sell entertainment for kids. The only danger here is that any child you bring may soon be bugging you to take them to the South Pole to see real penguins. The next best thing is a visit to Seattle’s Woodland Park Zoo or Tacoma’s Point Defiance Zoo and Aquarium, both of which have live penguins in residence.